Between Christmas Day and New Year's Day (also known as "between the flu and the sinus infection"), I was able to carve out a bit of time to work on a project in my son's "tween room." Due to the room's funky layout, the furniture is all placed on one side of the room. To keep the room from feeling unbalanced, I wanted to do something with the blank wall on the opposite side of the room. 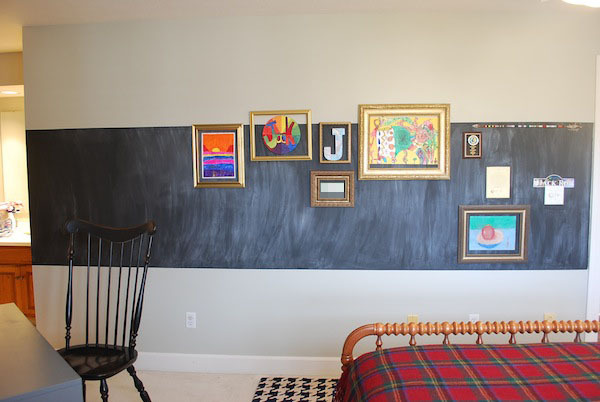 I knew I wanted to incorporate a chalkboard and a little gallery to display my son's artwork. I began by marking off straight lines with chalk, and applying painter's tape across the lines. Then I applied 3 coats of chalkboard paint inside the lines. The next day I "cured" the chalkboard by rubbing the side of a million pieces of chalk all over it until it was covered. This was the moment right before I put the damnit in DIY. I've made chalkboards before, and after this step I would normally wipe it clean with an eraser and be good to go. This time I used advice I read on the internet and used a damp cloth to wipe it down. Why?? I'm like that girl in the commercial who believes everything she reads online. ARGH! Now I've got some weird chalk swirls that won't erase and give me vertigo. You'll see what I mean in the next few pictures, because by this time, my sinus infection was taking hold, I had a screaming headache, and I just wanted to plow forward with this project. So I started creating the "art gallery" portion of the project, knowing that I'd have to eventually fix the actual chalkboard. I had to take this picture lying on the bed because the chalk swirls were making me so dizzy. I got some frames. Some I found around the house and a couple were bought on the cheap at Goodwill. I used rub-n-buff on one wood frame to give it a gold finish. Another one I spray painted a metallic gold. The others were already in the gold family. I removed the glass from the frames. I wanted my son to be able to rotate the art when he felt like it. 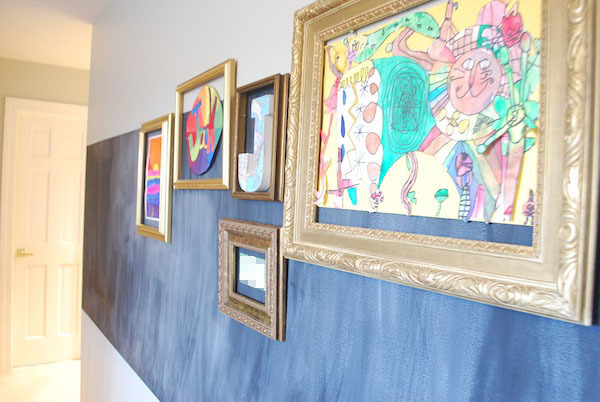 The frames are hung with a small brad, and the art is applied directly to the wall with sticky tack. In addition to art, there are some other items displayed that have special meaning to my son.... his first ever paycheck from a rock band gig, his scouting arrow of light, and an award he won at his elementary school graduation. He was chosen out of all the 5th grade boys to receive the award for being an overall outstanding student. That was such a huge honor for him, and I love that he can see the plaque and be reminded (especially on bad days) that he is special. I still wanted to leave plenty of room for him to use the chalkboard, too. So, tell me ... am I the only one who screws up a simple DIY project? Is there a way to fix the chalk mess without repainting?? Good luck...the gallery is charming. Hello, Dear! Oh, I've had my share, but not with a chalkboard...(yet) ~ It's really cool, though!I've come to your blog from the blog of one of my sweet commenters ~ you know how that goes ~ :) ~ Now following you!